Design engineers require specialized software, tools, and apps to research and develop ideas for new products and their associated systems. You need to be able to create blueprints and schematics for structures, systems, machines, and equipment and work collaboratively with other engineers, drafters, and team members, and you need to be able to work productively and efficiently. That’s why design engineers’ software, tools, and apps need to streamline your design and development processes rather than hinder them. We at Pannam recognize all of the challenges and demands design engineers face, so we have compiled a list of the top engineering design tools, software, and apps in the hopes of making your job a little easier. Our top engineering design picks cover mechanical, electrical, and structural engineering design needs and include CAD programs, simulation tools, modeling tools, digital prototyping software, engineering calculation and conversion tools, pocket reference, and other solutions specifically for design engineering. Please note, we have listed our top engineering design software, tools, and apps here, in no particular order. 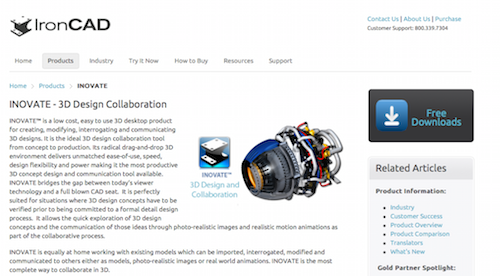 Autodesk is best known for its 3D design and engineering software and services. We like Autodesk Product Design Suite because it is a comprehensive 3D product design solution that offers everything design engineers need, from simulation, to collaboration, to visualization, to digital prototyping tools. Complete your entire engineering process with Autodesk Product Design Suite. 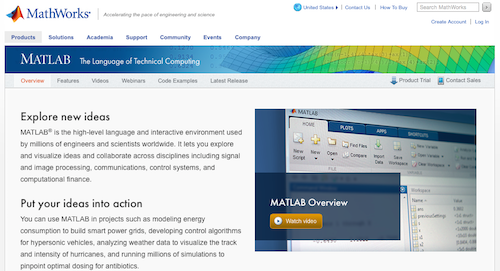 A high-level language and interactive environment for numerical computation, visualization, and programming, MATLAB is an engineering design tool preferred by millions of engineers and scientists worldwide. With MATLAB, you can explore and visualize ideas and collaborate across disciplines to put your ideas into action. ZWSOFT is a well-knwon CAD/CAM solutions provider. Their ZW3D is an all-in-one CAD/CAM solution that is designed for the complete product design and development process. This engineering design tool features an easy-to-use 3D CAD module that greatly reduces design time. 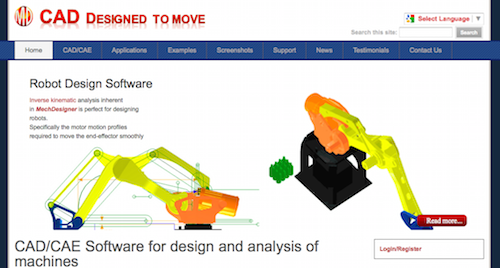 MechDesigner is an engineering design tool that was developed specifically for the design and analysis of machines and products that have moving parts, and for those parts to move the way you want them to move. With MechDesigner, you can ensure that your designs will move smoothly and with precision, even if your machine or product has complex motions, multiple interacting mechanisms, Cams, gears, or CAD designed parts. PTC seeks to enable manufacturers to achieve product and service advantage in the age of the Internet of Things. 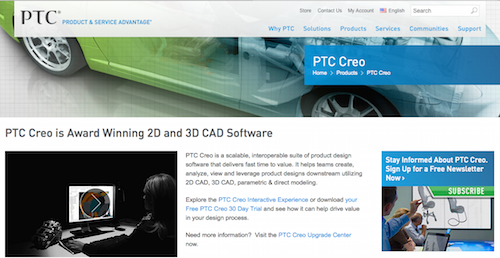 Their award-winning 2D and 3D CAD software, PTC Creo, is a scalable suite of product design software that promises fast time to value. With PTC Creo, design engineering teams create, analyze, view, and leverage product designs utilizing 2D CAD, 3D CAD, parametric, and direct modeling. BricsCAD offers the familiar .dwg CAD features design engineers are accustomed to, but adds time-saving tools and 3D direct modeling at an affordable price. This powerful CAD platform “unifies advanced 2D design with the intelligence of 3D direct modeling,” for Windows, Linux, and Mac users. 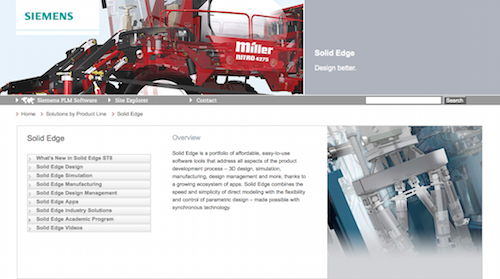 Solid Edge, a portfolio of affordable, easy-to-use software tools, addresses all aspects of the product design and development process for design engineers, including 3D design, simulation, manufacturing, design management, and more. With its synchronous technology, Solid Edge combines the speed and simplicity os direct modeling with the flexibility and control of parametric design. 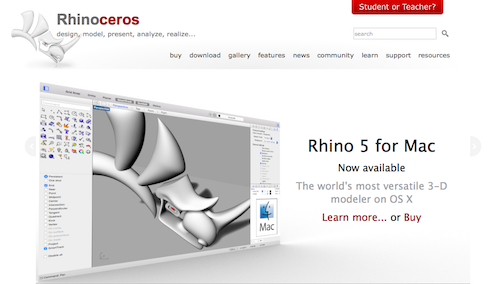 Rhino 5 is the world’s most versatile 3D modeler, available for Windows and Mac. With thousands of modeling and editing tools, Rhino is a complete engineering design tool that enables you to create, edit, analyze, document, render, animate, and translate NURBS curves, surfaces, and solids, point clouds, and polygon meshes without any limits on complexity, degree, or size beyond those of your hardware. SolidFace is a 2D/3D parametric historic constructive CAD modeler. SolidFace enables design engineers to accelerate their designs, increase productivity, and reduce cost with its 3D solid modeling that delivers true visualization and real testing prior to manufacturing. Geomagic, a leading provider of 3D software, helps design engineers create digital models of physical objects for reverse engineering, product design, inspection, and analysis. With Geomagic Design, design engineers get comprehensive 3D CAD tools for design, engineering, and preparation for manufacturing. 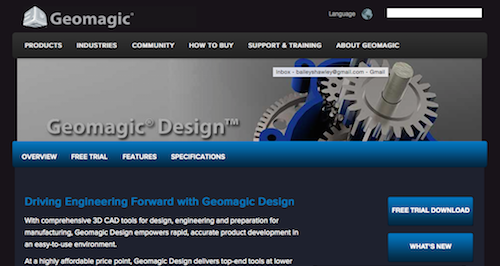 Geomagic Design ensures rapid, accurate product design and development in an easy-to-use environment. 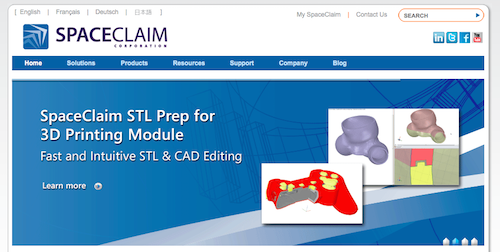 SpaceClaim, a fast and innovative 3D direct modeler, helps design engineers solve geometry problems quickly. With SpaceClaim, you can work with 3D modeling software quickly and easily, anywhere in the workflow. 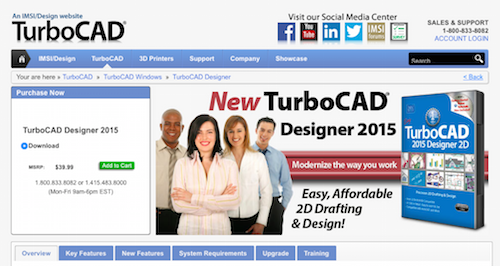 TurboCAD Designer delivers easy and affordable 2D drafting and design at the beginner, intermediate, and advanced levels. Design engineers can complete all of their technical illustrations with TurboCAD Designer, which provides access to hundreds of 2D drawing, modifying, and dimensioning tools. 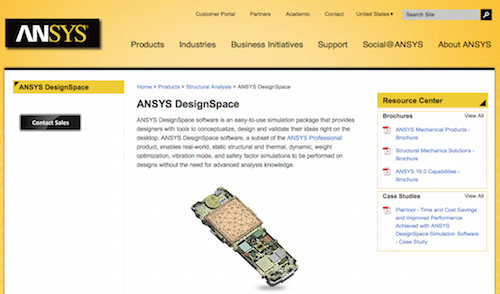 ANSYS, Inc. offers engineering simulation software, and ANSYS DesignSpace is the easy-to-use simulation tool that provides design engineers with the tools necessary for conceptualizing, designing, and validating their ideas right on their desktops. Even without advanced analysis knowledge, design engineers are able to perform real-world, static structural and thermal, dynamic, weight optimization, vibration mode, and safety factor simulations on designs when utilizing ANSYS DesignSpace. MSC Software provides simulation software for virtual product development. 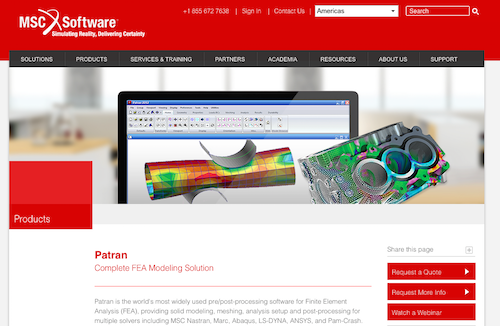 Patron is their complete Finite Element Analysis (FEA) modeling solution for design engineers that provides solid modeling, meshing, analysis setup, and post-processing for multiple solvers including MSC Nastran, Marc, Abacus, LS-DYNA, ANSYS, and Pam-Crash. 3DS SIMULIA, powered by Dassault Systèmes’ 3DEXPERIENCE Platform, provides realistic simulation applications that enable design engineers “to explore the real-world behavior of product, nature, and life.” SIMULIA applications accelerate the process of evaluating the performance, reliability, and safety of materials and products before design engineers commit to physical prototypes. 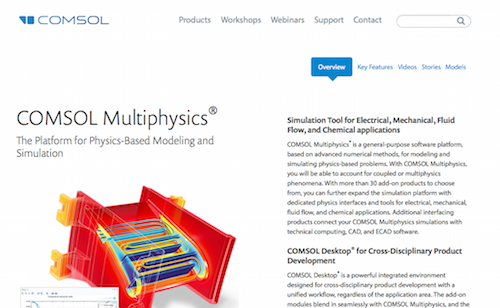 COMSOL Multiphysics is “the original multi physics simulation software.” COMSOL is a platform for physics-based modeling and simulation that serves as an engineering design tool. This general-purpose software platform is based on advanced numerical methods for modeling and simulating physics-based problems so that design engineers can account for coupled or multi physics phenomena. ANSYS Fluent software for design engineers contains the physical modeling capabilities needed to model flow, turbulence, heat transfer, and reactions for industrial applications. 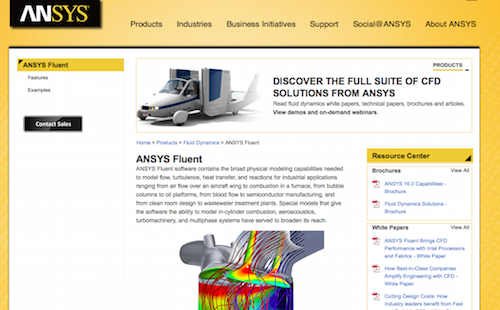 ANSYS Fluent is an engineering design software solution that includes special models so the software is capable of modeling in-cycle combustion, aeroacoustics, turbomachinery, and multiphase systems. ANSYS Fluent is considered an integral part of the design and optimization phases of global companies’ product development. Maplesoft provides software for engineers, and MapleSim is their advanced physical modeling and simulation engineering design tool. 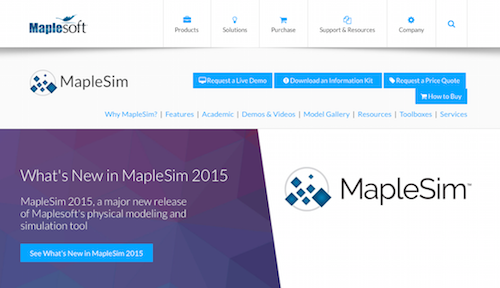 Apply modern techniques to greatly reduce model design and development time, provide greater insight into system behavior, and produce fast, high-fidelity simulations with MapleSim. The Engineering Toolbox is an online tool for design engineers that provides resources, tools, and basic information. The tool adapts for smartphones, tablets, and desktops so that design engineers always have the optimized version of the toolbox available to them. Electrical, mechanical, and structural engineers will find The Engineering ToolBox useful as an engineering design tool. An advanced engineering simulation software program suitable for design engineers, Femap creates finite element analysis models of complex engineering products and systems and displays solution results. Femap virtually models components, assemblies, or systems and determines the behavioral response for a given operating environment. Linear Technology offers several custom design simulation tools and device models to allow design engineers to quickly and easily evaluate circuits using high-performance switching regulators, amplifiers, data converters, filters, and more. These engineering design tools are available online, free of charge, and provide design engineers with fast, reliable simulations and models. KeyCreator Direct CAD is a complete direct CAD software for design engineers who are looking for a flexible, quick way to create, change, analyze, or communicate a mechanical part or design. KeyCreator makes it possible to master your geometry and quickly produce 3D design concepts without constraints. FreePCB, a free, open-source PCB editor for Windows, is capable of producing professional-quality work for design engineers. FreePCB is a design tool that helps design engineers quickly create PCBs of 1 to 16 copper layers. Fairchild is a global leader in power semiconductor and mobile technology. 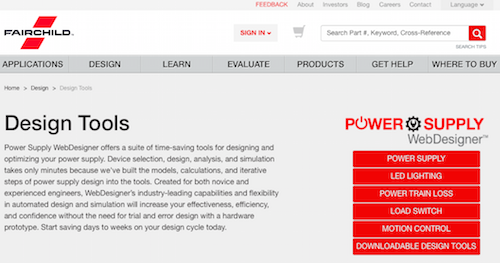 Their Power Supply WebDesigners is a suite of time-saving tools for designing and optimizing your power supply. This engineering design tool suite includes the models, calculations, and steps to make selecting, designing, analyzing, and simulating your power supply a much quicker process. 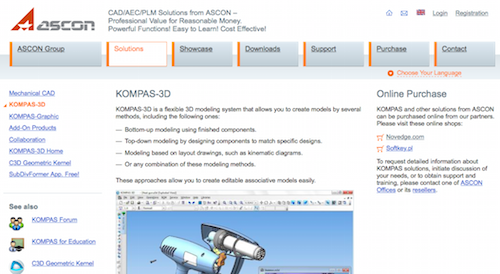 KOMPAS-3D, a flexible 3D modeling system, is an engineering design tool that allows design engineers to create models using several methods. Create editable associate models easily using KOMPAS-3D and its powerful functions that can manage projects with thousands of sub-assemblies, parts, and standard library products. 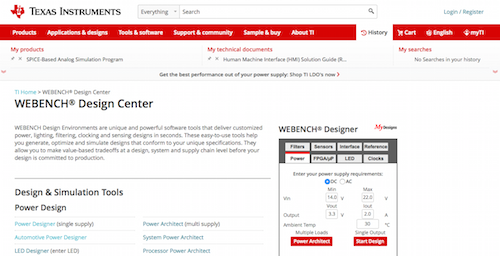 WEBENCH Design Center, from Texas Instruments, offers powerful online software tools that help design engineers generate and simulate designs that conform to unique specifications. Optimize your designs and make value-based tradeoffs at the design, system, or supply chain level before committing your design to production with WEBENCH Design Center. TinyCAD, an opens-ource program for drawing electrical circuit diagrams, or schematic drawings, is a handy engineering design tool that supports standard and custom symbol libraries. TinyCAD also supports PCB layout programs with several netlist formats and is capable of producing SPICE simulation netlists. CircuitLab is an in-browsewr schematic editor and circuit simulator that helps design engineers save time designing and documenting their projects. CircuitLab’s professional-grade schematics, wiring diagrams, and precise simulations make it the perfect engineering design tool. DraftSight CAD Software allows design engineers to access existing DWG files and create new ones at an affordable price. 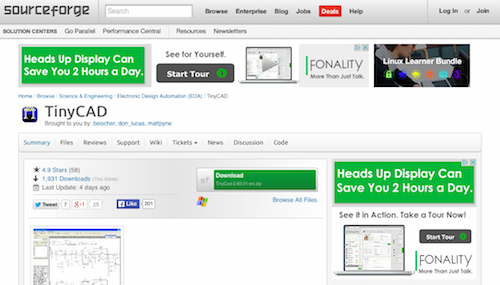 DraftSight’s familiar user interface and ease of use make it a top CAD pick among design engineers. DraftSight CAD Software is available as a free download for students, hobbyists, and other individuals, in a professional pack for small and medium-sized companies, and in an enterprise pack for large corporations. 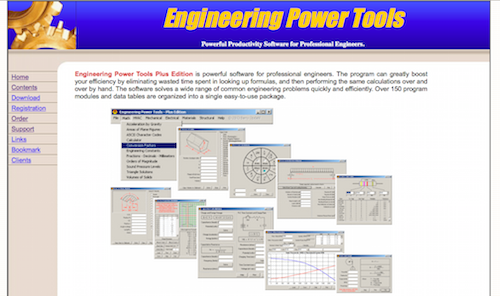 Engineering Power Tools Plus Edition is powerful software for professional engineers. Design engineers who use Engineering Power Tools increase their productivity and efficiency because they avoid looking up formulas and performing repeated calculations. IronCAD is a leading provider of innovative design collaboration solutions, which deliver productivity and design freedom. IronCAD offers INOVATE, a 3D design collaboration tool for design engineers that allows for creating, modifying, interrogating, and communicating 3D designs, from concept to production. 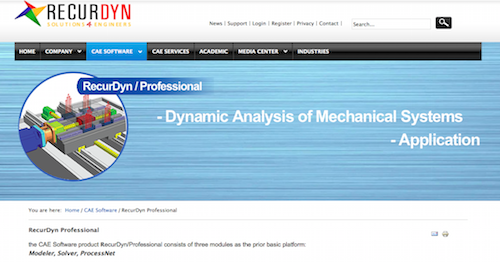 RecurDyn Professional is a CAE software solution for design engineers that consists of three modules: modeler, solver, and ProcessNet. With RecurDyn Professional, design engineers can test various conditions, even when they are difficult to repeat. This engineering design tool is also able to detect problems and product defects and solve them. SOLIDWORKS Industrial Designer (SWID) is a concept design tool that helps design engineers quickly generate multiple industrial design concepts in response to a design brief. SWID includes unique tools for the rapid creation, manipulation, and modification of designs using both native and imported geometry. With SWID’s broad-based collaborative framework, design engineers accelerate their designs and reduce costs. QCAD is a free, open-source 2D CAD program for Windows, Mac, and Linux. With QCAD, design engineers are able to create technical drawings for mechanical parts, schematics, and diagrams. 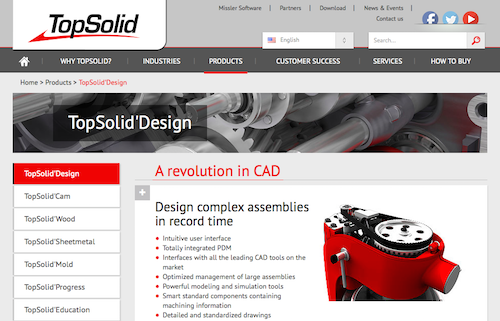 QCAD’s intuitive interface and ease of use make it a top pick among design engineers. PunchCAD offers tools for engineering designs that require 2D or 3D rendering. 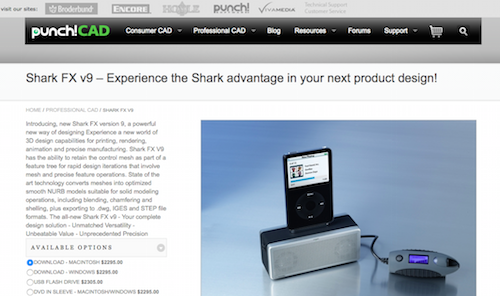 Their Shark FX version 9 features new and powerful 3D design capabilities for printing, rendering, animation, and precise manufacturing. Shark FX V9 also helps design engineers with rapid design iterations involving mesh and precise feature operations, with its ability to retain the control mesh as part of a feature tree. 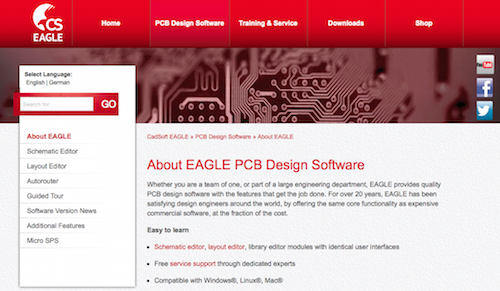 EAGLE PCB Design Software has been helping design engineers on a global scale for more than 20 years. An engineering design tool fit for a team of one or a large engineering department, EAGLE PCB Design Software offers the same core functions as expensive commercial software but at a fraction of the cost. PCSCHEMATIC Automation is a top choice for electrical engineers looking for an intelligent electrical design software solution. This engineering design tool is a professional solution for drawing schematics for electrical wiring diagrams, control circuit diagrams, pneumatics, and hydraulics. Tim Edwards created XCircuit, a program for drawing publishable-quality electrical circuit schematic diagrams and related figures, that is available as an online engineering design tool. XCircuit also produces circuit netlists through schematic capture and writes both hierarchical PostScript output and hierarchical SPICE netlists. As an engineering design tool, Autodesk Digital Prototyping helps design engineers make great products by replacing siloed tools with integrated ones. Autodesk Digital Prototyping makes it possible for design engineers to streamline the entire product design and development process because they can explore their ideas before building them. An open-source software that provides a generic platform for pre- and post-processing for numerical simulation, SALOME is an engineering design tool that is based on an open and flexible architecture made of reusable components. Design engineers use SALMOE both as a standalone application for generation of CAD models and as a platform for integration of the external third-party numerical codes to produce a new application for the full life-cycle management of CAD models. GeckoCIRCUITS is a circuit simulator for modeling power electronics systems. This engineering design tool delivers fast circuit simulation capabilities, plus combines control modeling and thermal simulations. 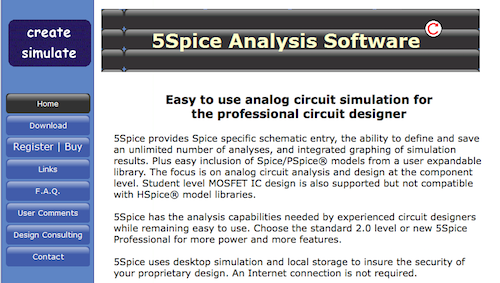 5Spice is an easy-to-use analog circuit simulator for professional circuit designers. This engineering design tool provides Spice-specific schematic entry, as well as the ability to define and save an unlimited number of analyses and integrated graphic of simulation results. NX for Design, an integrated product design solution, is an engineering design tool that streamlines and accelerates the product development process for engineers. 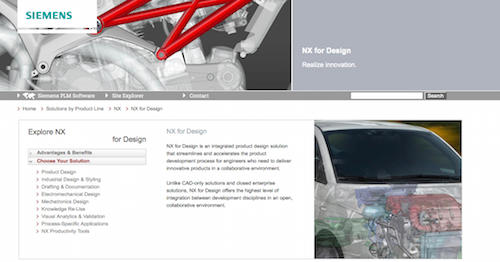 Deliver innovative products in a collaborative environment using NX for Design. 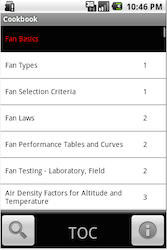 Professor S. Bhattacharjee of San Diego State University offers Engineering Unit Converter, a comprehensive engineering unit converter available for Android devices. This handy engineering design tool features an intuitive spinning wheel interface and helps design engineers convert units from anywhere, any time and has earned a 4.3 star rating from more than 2,370 Google Play reviewers. 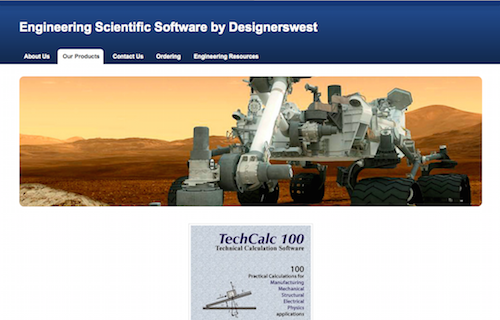 Designers west publishes TechCalc100 engineering and scientific calculation software that helps design engineers rapidly complete calculations. The practical calculations provided by TechCalc100 are useful for mechanical, electrical, structural, and physics calculations, making this engineering scientific software by Designerswest a handy engineering design tool. The Engineering Cookbook is a convenient reference guide for mechanical designers. This engineering design tool is an Android app that provides access to information frequently needed by mechanical designers, in the palm of their hands. 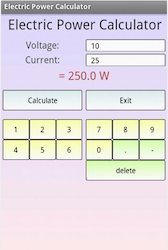 An Android app, Electrical Engineering is an engineering design tool that provides three tools in one: an electrical calculator, an electrical circuit calculator, and electrical formulas. The app also covers a broad range of subfields including electronics, power engineering, telecommunications, control systems, radio frequency engineering, and signal processing.